Glittery Pumpkins- We obviously are biased but glitter pumpkins just make the best decorations. Look at these that we made using some of our glitters. The Jack’o’lantern is in our gorgeous Copper glitter and we also made these little foam pumpkins from Hobby Craft in our Fuchsia, Rose Pink and Purple Grape. Spider Webs made with lolly sticks – Just grab some lolly sticks, stick three together in a kind of star shape and paint them whatever colour you fancy, wrap some yarn around the sticks to create a web and decorate with spiders. We got this cool idea from Buggy and Buddy – take a look. Edible Glittered candy apples – Make some classic toffee apples, we love this recipe from BBC Good Food and cover them in edible glitter. You can get some really cool glitters from all over but the Cake Craft Shop have an amazing fully edible range of decorations. Hanging toilet roll bats – This is a really good craft to do with the kids and even young kids can get involved with the painting. Grab some empty loo roll cardboard and paint them black. Cut out the wings from whatever you fancy – card, or paper in black and then stick the wings to the back of the cardboard roll. Pop some googly eyes on the front and draw a mouth and fangs if you want a vampire bat 🙂 and hole punch two holes for the legs to go through. Use black pipe cleaners to go through the holes for the legs and make sure to hook the ends over so you can hang your bats around the house. Take a look at Buggy and Buddy’s tutorial for a more in depth look. 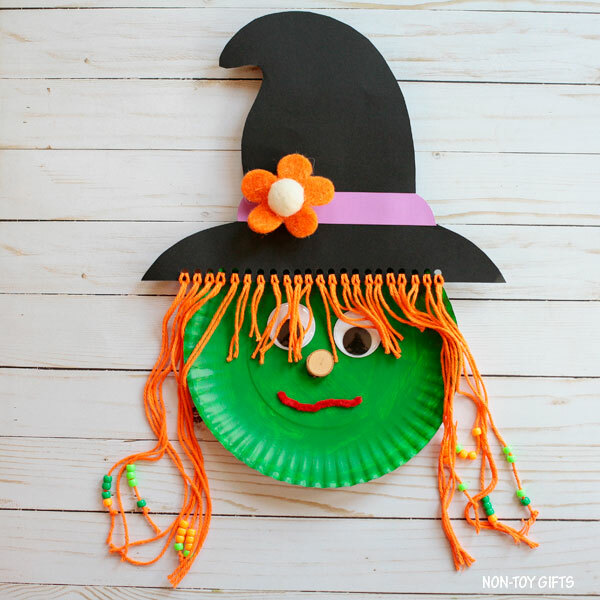 Paper Plate witches – These paper plate witches from Non Toy Gifts are such a good idea for older and younger kids alike. Painting is such a fun activity and they can make their witches as wicked or wonderful as they want. Wax resist spooky art – This can be such a good activity for a Halloween party. Get the kids to draw their desired picture with wax crayons. Water down some black watercolour and watch as their pictures take on a spooky look. These ideas from Activity Village are what inspired us. Cotton ball ghosts– Create your own friendly ghosts to hang around the house just using some cotton balls! This awesome blog post by Housing A Forest, has a free print out as well so you don’t have to worry about the faces, just get sticking to create your own ghost shapes. Pumpkin jar lantern – If you’re anything like me, you have A LOT of scrap tissue paper laying around. We love these lanterns by Red Ted Art , all you need to have is some empty jam jars and some watered down PVA glue. Take a look at the link to see how it’s done. Yarn wrapped mummy – Grab some black card and cut out a mummy shape or like a gingerbread man shape I would say. Cut some white yarn into a decent length and just get wrapping. The beauty with this craft is there is no right way to wrap it so each person will end up with a different mummy. We loved this tutorial from I Heart Crafty Things. We love this collection of Halloween crafts and we think there is a little something for all ages to have a go at on the list. Let us know if you try any out for yourself. We are so in the mood for Autumn here at Crafty HQ and we have collected 5 of our favourite craft ideas for this time of year. Glittered pine cones – Collect all shapes and sizes from your Autumn walks, grab some glue and throw some glitter on them. We love these ones we made with our green, red and gold glitter. Perfect for your Christmas tree or Autumn home decor. Pumpkin Apple Stamps – A brilliant one for kids, cut a large apple in half and use them to create pumpkin shapes. Once the orange paint is dry, they can make whatever scary or smiley faces they like with black paint. Painted Acorns – Like the pine cones, grab some acorns on your travels. We love the idea of painting them in pastel colours and using them as decor for the house. Glittered pumpkins – We got some foam pumpkin decorations from HobbyCraft and just used some simple PVA and our glitter to makes these beauties. Leaf Sun catchers – We love this idea for the kids to have a go at. Cut out the centre of a paper plate and fill it with tracing paper, simply glue some leaves to the tracing paper part of the plate for the beautiful autumn colours to catch the light, hang with some ribbon. We are totally in love with this season and there are so many cool crafts to be done. What are your favourite Autumn crafts?